It was going to be a long thirteen hour shift – even before the party started. At 9am sharp the truck delivering the lights arrived. 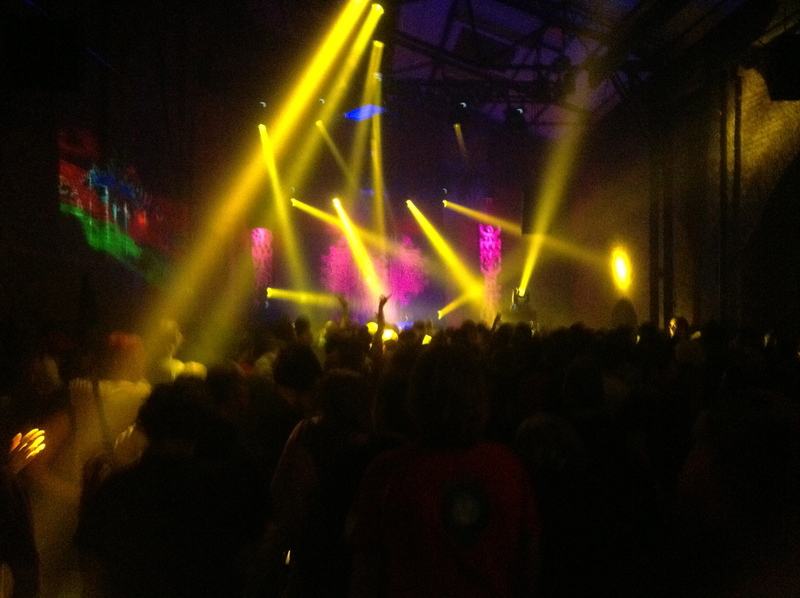 Julian (SP23’s lighting engineer) had an epic vision: a dance of light; the high warehouse space shot-through with threads of piercing energy; the air woven and sliced with beams of living colour. 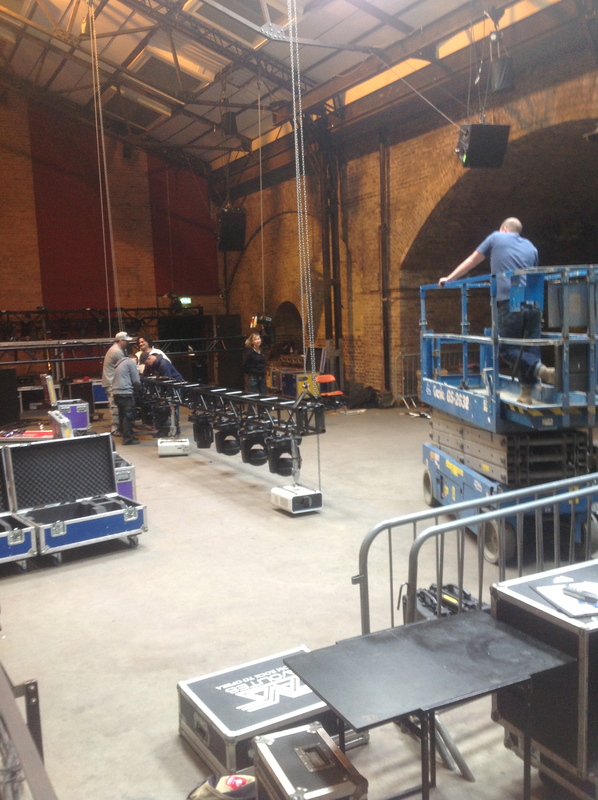 It took a full half hour for us to unload and wheel in the flight cased lighting equipment and all day to rig the show: two fully loaded trusses above the stage and one forming a spine that ran the entire length of the building. 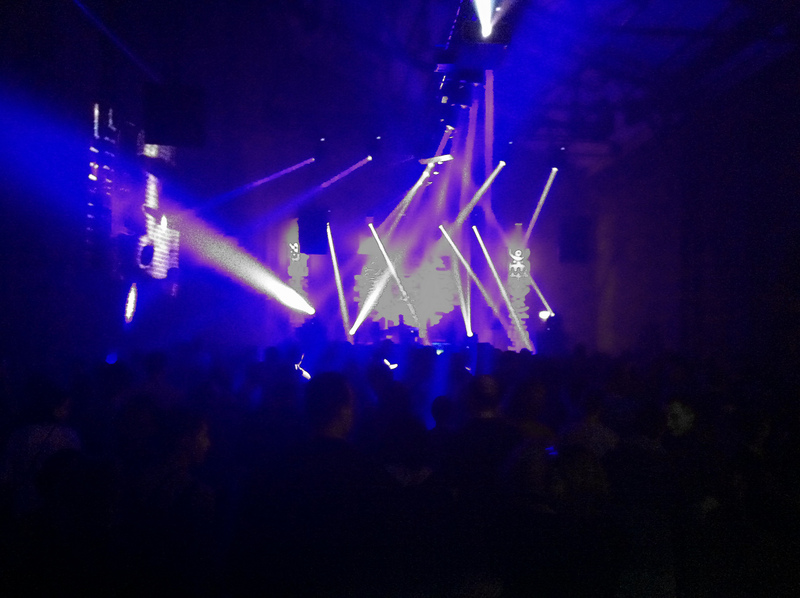 As the clock ticked, it was all hands on deck to transform the Victorian freight warehouse and railway arches into SP23’s inter-dimensional dance zone. 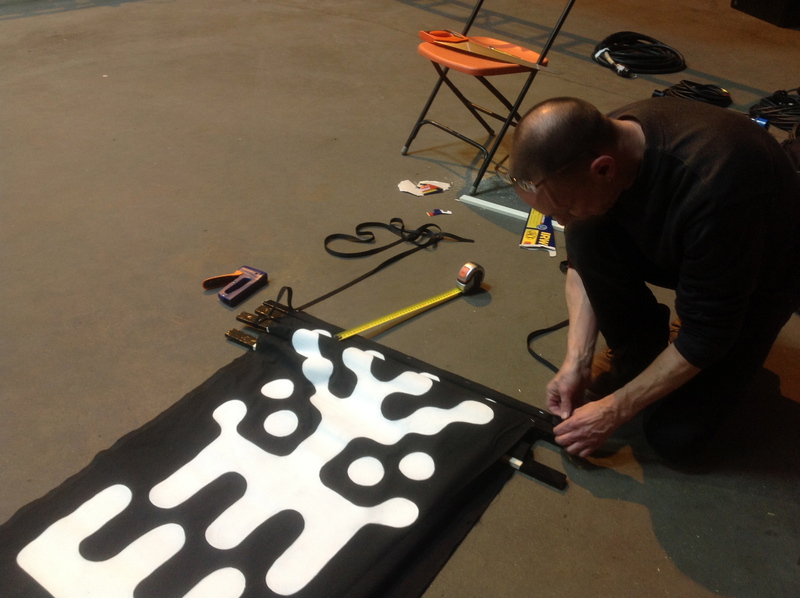 Directed by Julian; 69DB, Meltdown Mickey, Jeff23 and Sirius got on with bolting lights to the trusses, while Feenix 13 and myself (Stray Wayward) unfurled our latest creations: long black banners painted with shape-shifting totemic characters. 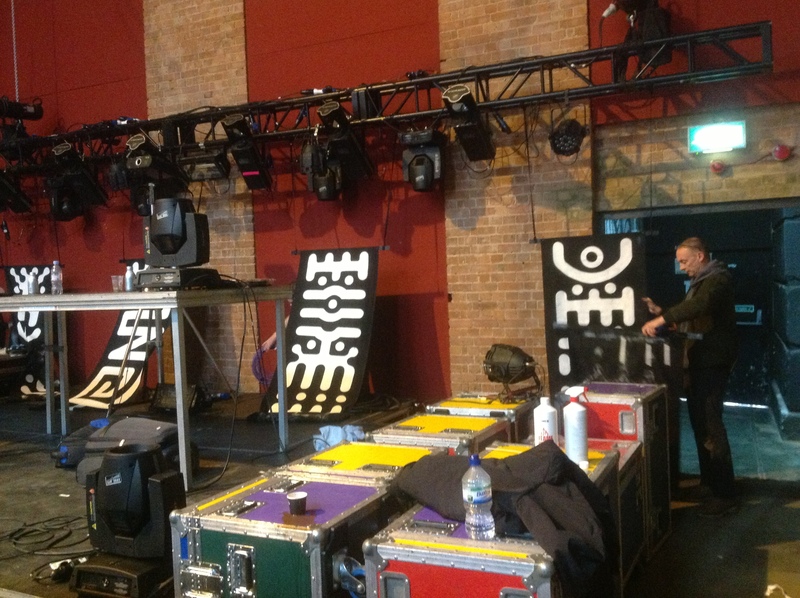 In the afternoon more of our crew arrived, Tim (Noise Control Audio) and Mickey, constructed the wooded frames to carry the stage flats: three large screens emblazoned with the SP23 circuitry motif. Bad Girlz, Ixy and Sim, helped stretch the fabric across the frames while the artwork was stapled into position. 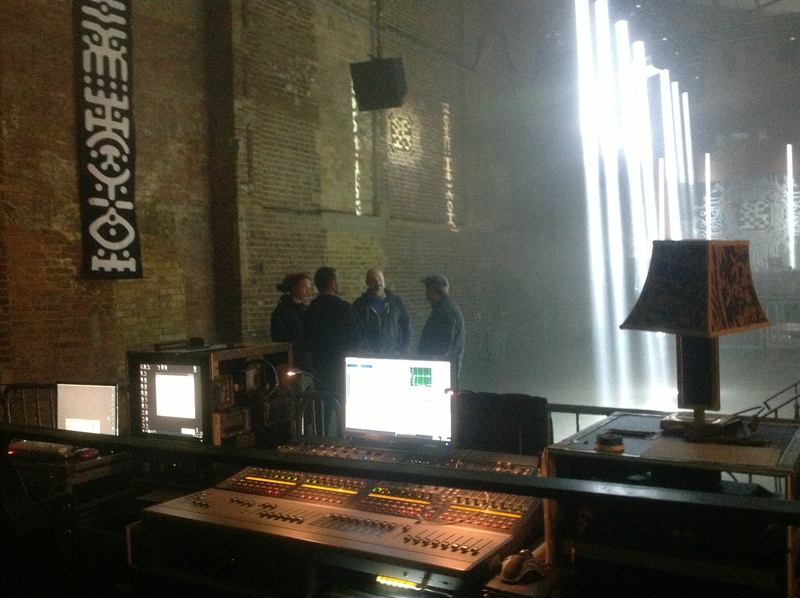 By early evening the décor was in position and we were ready to test-fire the light show and do the sound checks. Welcoming in the early streams of people were the Bad Girlz – twinkling cheekily through an energizing repertoire of upbeat lyrical gems. 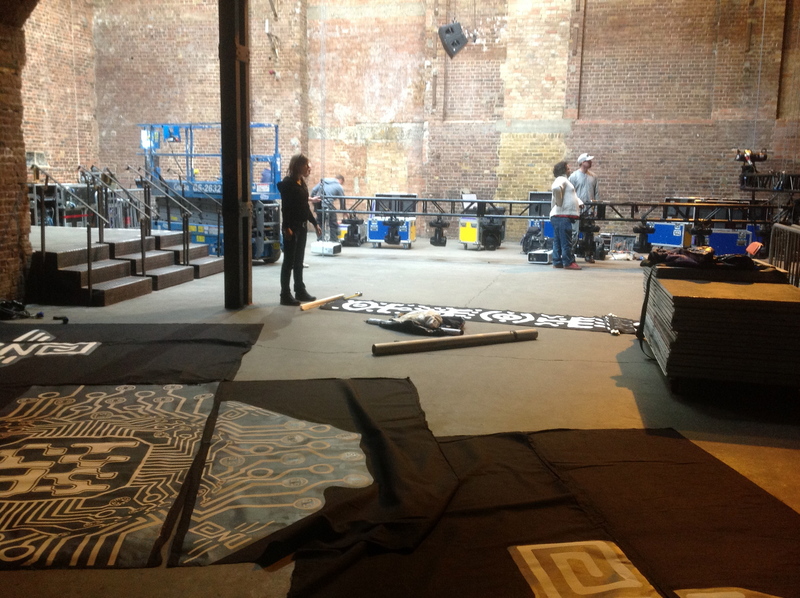 From Ixindamix’s trumpet solos to Sim Simmer’s rousing vocal incantations, the floor began to take shape as long lost friends reconnected in the half light and new faces gazed up at the trusses and the vaulted brickwork. Meltdown Mickey was next up, taking things deep and rolling as he wove a hypnotic groove through the dancefloor. Building up a rippling unity with a pure techno selection, he had laid the charges for what we felt was a very special night. By 12:30 – it was rammed. The lights seemed to be piercing raw space from every angle – at once disorientating and yet vividly lucid. There was an unmistakable edge on the night already – love and unity laced with a sense of something intangible shooting through the prisms. By the time I’d finished playing a cocktail of party tunes, the sound system was firmly hitting the sweet spot and the momentum was rising. 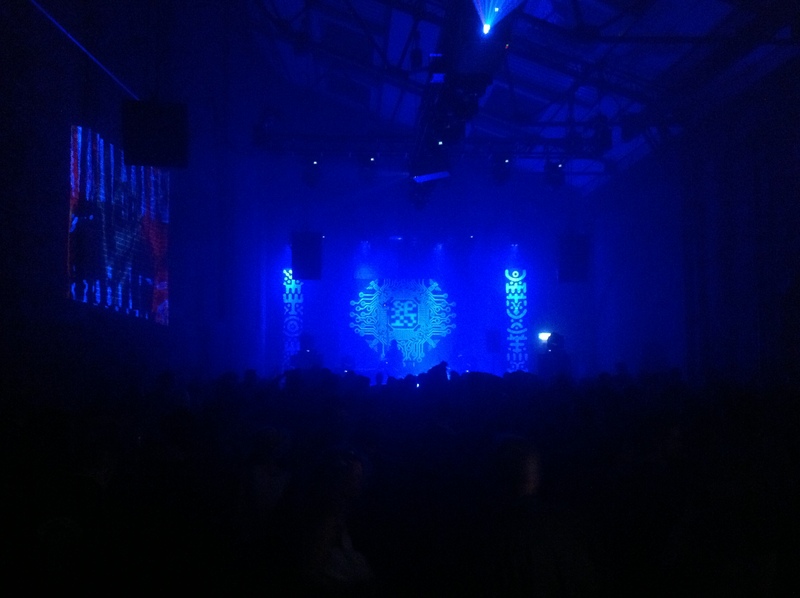 69db stepped up and slammed down a journey through improvised acid techno. 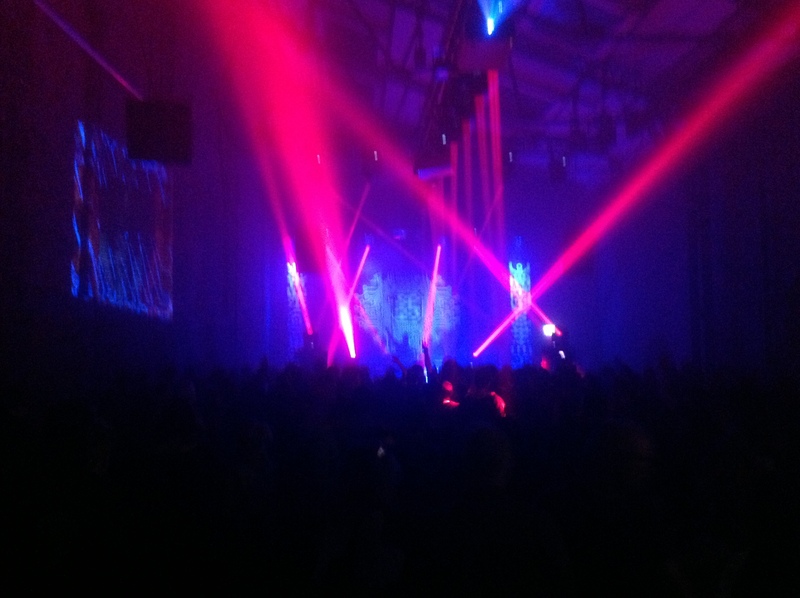 Tribal rhythms rode fat n funky basslines as abstraction flashed through the frequencies and acid lines ripped through the shards of light, pushing the warehouse deeper into the moment. As Crystal Distortion plugged himself into the matrix, harnessed chaos was unleashed. Electricity erupted through the dancefloor as he swept into a coruscating flow. 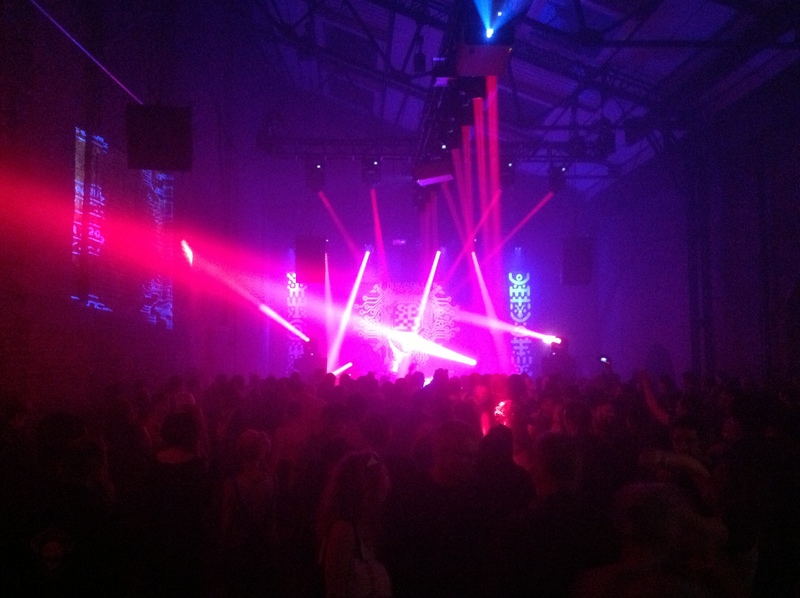 Oscillating between psychedelic glimpses and ruthless urban assaults, he charged the atmosphere with a steely euphoria and handed over to Ixindamix. She instantly sent deep acid screaming through the system, stripping back the beats early and rolling warm uplifting basslines through the subs. Building up to a liquid crescendo, she spiked her set with quirky flashes and a dynamic intensity as the crowd heaved and the video mapped walls burst with movement. 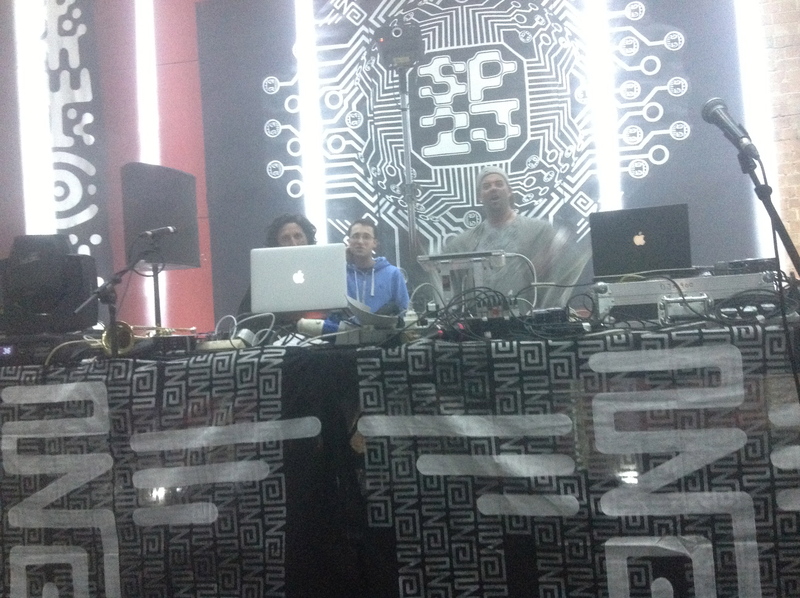 A laser traced the back wall with esoteric patterns as the totems anchored the space into Jeff 23’s dark tribal waves. Mixing up 4 tunes at once, Jeff tore through the line between experimental and primal with a unique take on new wave techno. Sending mesmerising frequencies hurtling though lockdown, he was just taking things to a final peak when all too quickly – it was over. At least until the next time. 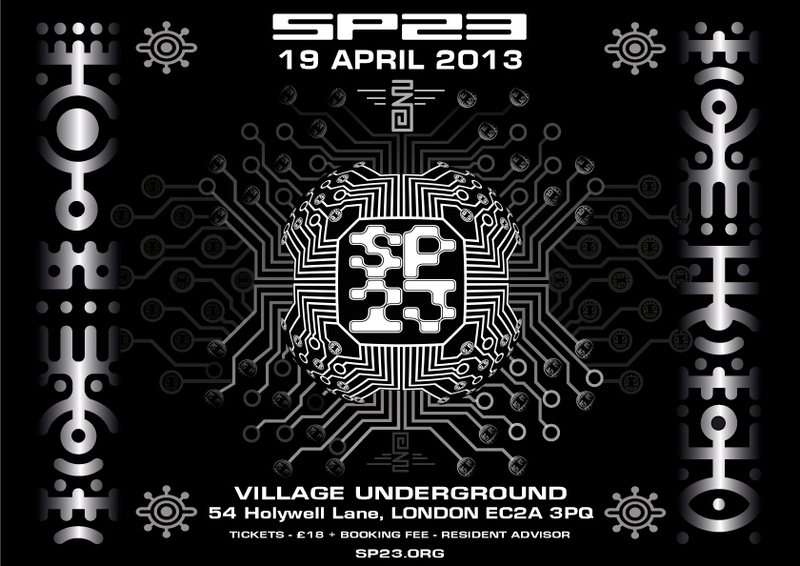 This entry was posted in Cultural sPace and tagged SP23 London, Village Underground. Bookmark the permalink.